I think this idea is too much fun not to share!! My kids LOVE getting in on cooking lunch when we make these Melting Snowflakes! And of course…no two look exactly alike! Start by folding a tortilla into fourths. Use kitchen shears to cut notches out around the tortilla. Open up the tortilla that has now become a snowflake. Place a whole tortilla into a skillet…sprinkle with cheese. Isn’t that such a fun, yummy way to eat lunch?! Oh, and bake the “cut out” scraps from the tortillas for a few minutes at 350 degrees for chips to dip in salsa. I also think it would be fun to fold a tortilla in half and cut it into a heart for Valentine’s Day…don’t you think so!? Hurry Up and Get Your Kids in the Kitchen! You know how I often talk about how important it is to get your kids in the kitchen with you?! I’ve been sick the past few days…but everyone around here still wants to eat. Don’t they know that when mama is sick, the world must stop until I wake up and feel better? Huh-uh…it just doesn’t happen. I have NEVER been so thankful that I’ve taught my kids their way around the kitchen. Daddy’s doing great taking over in there, but sometimes he’s not home when the boys are hungry. Or when I need something to eat. AND, Daddy has been working hard trying to juggle all his work and mine too. How nice for the boys to get a meal started so that he doesn’t have to come home and do all the cooking too. My boys aren’t at the point where I can just turn them loose in the kitchen and tell them to whip up some spaghetti. But because of all the time they’ve spent in there learning and working with me, they can go in there and do the whole thing with me just laying on the couch telling them what to do. I’m so proud of them. My boys LOVE the summer library reading program in our town…therefore they are inspired to read like crazy all summer long! Matt is great at assigning the boys outdoor projects…and they love doing these jobs with and for their dad! It is amazing how much help they can be with yard work, hauling stuff, cleaning up wood and sticks, etc. I LOVE watching them work with their daddy! Inside the house, the boys and I have fun making up new recipes and cooking together. And we play tons of games of Skip-bo. And War. And Old Maid. And Crazy Eights. And we make up our own card games. This week one of our kitchen projects was making cool shaped pancakes. Using this whole wheat pancake recipe with a couple of extra tablespoons of milk stirred into the batter…we filled a ketchup-like container with pancake batter and started getting creative with pancake shapes and letters. Here, Justus is working on a “J” for Justus. We were pretty happy with the way this bear and bunny turned out. We decided the bunny reminded us of Buster on Arthur! I LOVE this extra “down time” with my kids! I’ll look forward to sharing more ideas with you during the next several weeks! Here’s to a wonderful fun summer with our kids! Find more great ideas at Rocks in My Dryer! Kids in the Kitchen: Making Cheesecake For Mom! One tradition is that we take the pictures of our boys beside the peach tree that we planted a few years ago. Each year, it is super fun to see how much the tree has grown and how much the boys have grown. We then email these pictures to all of the special women in our lives for Mother’s Day. I LOVE looking back at these pictures! I absolutely NEVER want to eat out on Mother’s Day. I find the restaurants overflowing and stressful…and that is not a treat for me. So Daddy and the boys put on their aprons (not really) and cook for mama. I LOVE it!! You can read about the Mother’s Day Muffins they’ll be making here. And for lunch…they’ll be making steak on the grill, baked potatoes, veggies and cheesecake. In a gallon sized Ziploc bag, crush graham crackers with a rolling pin. Melt butter in a small saucepan. Pour crushed graham crackers, melted butter and sugar into a 9 x 13 inch pan. Stir ingredients together and pat it down to create crust. Set aside. In a medium sized bowl, stir together cream cheese, powdered sugar and vanilla. In a large bowl, whip the cream until soft peaks form. Add cream cheese mixture to whipped cream and fold in gently. Smooth mixture over the crust. Chill for at least two hours. This cheesecake is super simple to make…which means the boys can do it entirely by themselves! I love this Mother’s Day tradition…and so do Daddy and the boys! They look forward to it as much as I do! I’d love to hear about any Mother’s Day traditions you have!! What special things are YOU looking forward to this weekend?! Make a May Day Basket! I ALWAYS seem to forget May Day…until someone brings a cute May Basket to our door. Then the kids get all excited and ask if we can make some. And at that point I feel like it’s too late to start thinking of a plan. We started working on our baskets three days early! The yellow cardstock pattern fits around a paper cup. The boys picked their favorite pictures from this sheet of cut-outs and glued them on. These were simple to make….and ALL of the boys had fun with them! I think they turned out ADORABLE! We’ll be filling the baskets with Tiny Cookie Bites. These cute little cookies are fun to make and yummy to pop into your mouth! Mix together melted butter and brown sugar. Stir in egg, salt, baking soda and vanilla. Add flour and mix thoroughly. Place tiny bits of dough on a baking sheet and bake for 7-8 minutes in a 350 degree oven. Find all the instructions and download the patterns and picture cut-outs in the Clever Creations section of the HeavenlyHomemakers site here. They are free for you to use! Have Fun!! Visit Tammy’s Recipes for more fun kitchen tips! Tomorrow, Justus and Asa are performing in a musical…more on that later!! Each family involved with the musical is supposed to take refreshments…so of course, I put my boys on the job! I wrote down a chocolate chip cookie recipe for them…handed it over, and asked them to double it. I left the kitchen (to go sit out in my hammock and sleep, of course)…and they made the cookies all by themselves! Oh – and to show the kids where the sugar was. How great it THAT? They are so used to using the good stuff…they didn’t even know where the sugar was!! Ah, at last, at picture of Justus cooking at ground level. And that this week they are in charge of cooking or helping to cook every meal. But, I’m learning a few things that I need to do to make it work better. And I’m thinking, “I wonder how they’ll do without my help? !” Because I’m usually in there walking them through everything and helping everyone share jobs so that the stirring and the pouring is all fair and stuff. But they did a pretty good job! I wish this picture wasn’t so dark…but this is what I walked into when I came into the kitchen after the baby’s bath… Don’t ask me what Justus was doing getting ready to launch himself from the countertop. Anyway…what I learned this morning is that I’m guilty of telling them what to do while they’re helping me, instead of letting them read the recipe and figure it out for themselves. So I need to turn them loose a little more. Like I did this morning. Also, I learned that my baking stuff needs to have labels on them. I buy it all in bulk and then put it into jars. And so…it seems that I’m learning things right along with my boys in the kitchen. I also learned that my boys like to talk a lot…and TOTALLY don’t get it that you need to efficiently get your food into the oven to start baking if you EVER want to start eating it. I kid you not…it was 11:15 when they finally had made their muffins, eaten them, and cleaned up after themselves. Here are a few highlights of the kids in the kitchen on Tuesday! Elias and Justus made scrambled eggs completely by themselves. They made a great team! You should have heard Justus (the professional egg scrambler) explaining to Elias the way to scramble eggs… It was SO cute! And Justus started browning the meat. Elias and Malachi helped mix the soup and veggies into the pot of meat. And Elias whipped the potatoes. For dinner, the boys helped me make Chicken Tortilla Soup. Justus used the food processor to chop up the tomatoes and chili peppers. Asa poured in the chicken broth. Malachi added the chicken and the corn. And, YUM…you have to try this soup that they made!!!! It is so good!! Allright…the dishes are done and the boys are off duty for the night! See ya tomorrow! This week…my kids are going to be doing most of the work in the kitchen (while I lie out back in a hammock sipping lemonade…). They are so excited to be put in charge this week! And they are learning so much! Each day this week I’ll be sharing the things I’m teaching them… It is SO important to start ’em young!! Here’s a look at what my kids did in the kitchen on Monday! Asa did great cooking his pancakes…he added blueberries just before turning them over…YUM! Justus got a little frustrated that his pancakes didn’t turn out pretty…but I assured him that they would taste great on his plate as a Great Pancake Pile Plop… He agreed. Lunch wasn’t too difficult, as we had burritos that I had made and frozen a week or so ago. Justus just put them in the oven to warm up…and then got to go work on math while they heated. And Justus scrubbed the burrito dish. …and sauteed them in butter with onion. Then we added the meat. Elias and Malachi got the noodles ready to boil. Then Elias washed the asparagus. And we sat down to a scrumptious dinner! Check back in tomorrow to see how they do! I love to see how much they’re learning!! 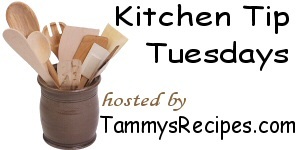 Take a peek over at Tammy’s Recipes to learn more kitchen tips! Please join me for today for Gratituesday! Kids in the Kitchen, pt. 8: Here’s What the Kids Are Cooking This Week! Lately, I’ve been working to get my kids in the kitchen more…and to encourage you to do the same! Read more on my Kids in the Kitchen series here. Each day this week, I’ll be making a focused effort to pull my kids (ages 3, 6, 8 and 10) into the kitchen to help…(even when it will be easier to just send them out and do it myself! )…and I’ll be snapping pictures and blogging each day about what they are doing and learning. Hope you’ll join us this week to see how it all goes! I’d love to hear what you’re doing with your kids in the kitchen!! Download your free pretty menu planners here! Hope to see you back here this week…for more Kids in the Kitchen! I’ll be posting pictures, ideas, recipes…and about all the crazy fun we’re having together!! See ya tomorrow!